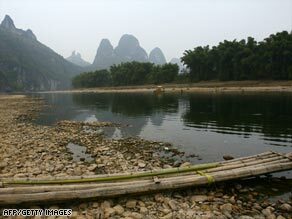 Water levels in some Chinese rivers are well below their average with 50 to 80 percent less rain than last year. In the drought, more than 4.3 million residents face a shortage of drinking water, as do 2 million livestock. The drought has hit 12 provinces, including the wheat-producing areas in Henan, Anhui, and Shandong provinces. Chinese media says the total area affected has reached 1,370 million hectares (3,385 million acres). With the emergency funding, teams of specialists have been dispatched to deliver technical expertise and relief supplies. The Anhui Agriculture Department is telling farmers in drought-hit villages to irrigate more efficiently, while other provinces have resorted to cloud seeding to induce rainfall. Some relief may be on the way. Xinhua reported Thursday that meteorologists expect light to moderate rainfall or snow in some drought-hit areas over the next couple of days.